The final stage of Road Trip 2016's J2 (Jess and Jen's) Vacation was two nights at the Four Points Sheraton French Quarter. We paid a small fortune and booked at least 9 months in advance to score a balcony room on Bourbon Street. We know, we know, that's a tourist attraction. But it's a wild, crazy, scary, hog wild entertaining time. It's supposedly better than Mardis Gras because the weather is more predictable. During Halloween there is generally no rain and the weather is still pushing upper 70's. So, for our entire trip, while back home in Oregon they are suffering through rain, we've been blessed with warm sunshine. Lots of these type of costumes...and my favorites. Our balcony room is on the 4th floor, which frankly, is a bit high to really get great photos. It is also too high to, in my opinion, safely throw beads. But, it's a great way to get the experience and not be in the thick of the madness. Oh and what madness it is. Take Vegas and multiply it times 1000. Take the best Halloween party you've ever been to, add 100,000 more people and that many more costumes, and you get this. It's a rip roaring, ear splitting, parade of freaks. It's people in elaborate costumes walking stately through the crowd to drunks stumbling past with their shirts off and often in their tighty whiteys (or purple or reds). It's a whole lot of men wearing less than they should be...tutus, speedos, naked lady costumes, feather boas, preacher outfits, and a hell of a lot of men in slutty dresses. And speaking of slutty, there are a few hundred slutty ladies, drunk ladies, church ladies, regal ladies, and even scary ladies. There are things out here that I may never forget, that my eyes won't forgive me for, and that my face will always have laugh lines to blame them on. Every barn animal, video game, nursery rhyme, Disney movie, Saturday Night Live sketch, fiction and non fiction movie, every condiment, food, and even occupation has been accounted for. No one or thing has been spared. Possibly a supporter of Alien Rights? And then there are the parades. They randomly come through the night, sometimes with a theme and other times not, bringing their marching bands, flashing lights, screaming costumed partygoers and beads. Beads everywhere. Beads being thrown from balconies, to balconies, on balconies, and on all the passersby who strut to and fro, oven passing our location up to 20 times or more. As they pass, we can see the transformation the night brings...from sober partier to fantastically intoxicated breast showing irresponsible freaks of nature. Hot guys were on the balcony below us. Literally. This one was burning up in this costume. Despite the noise and the smells of vomit, stale beer, sweat, all mixed with the fragrant of all types of food that torture of our senses, we keep watching. It's too entertaining to turn away. We spent around 5-8 hours just watching, laughing, tossing beads, comparing photos, toasting to the tragedy that is this scene. This is what we came for. To see grown men and women acting like animals. No doubt, that is what we have seen. We have also seen, here on Bourbon Street, the honest to goodness Church goers that come and try to push God's word in the faces of these animals. 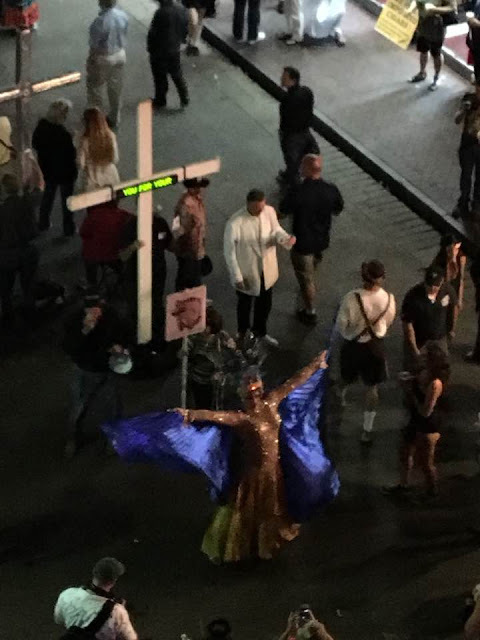 These Churchies carry 15 foot crosses and bring word of how terrible homosexuality is, of how we are all going to hell, of how only the righteous will be saved. They stand among the crowd with their bullhorns and their pamphlets fighting the good fight against evil. From my view, on the 4th floor, it appears that the only real evil in life is not accepting everyone for how they are and trying to push your beliefs onto strangers. Here, on Halloween, we accept them all. We welcome them all. Halloween in the French Quarter is something I would encourage you all to do once in your life. Take in the bliss that is the French Quarter, experience the freedom of becoming, just for one night or a weekend, whatever your heart desires. Because I'll always remember. And those memories are what make up a life.